The OmniLite Ti is the workhorse in the Primus range, designed for, and sold to, people for whom weight is secondary to reliability and versatility – and make no mistake: the OmniLite Ti is hugely versatile. Able to burn kerosene/paraffin, petrol/gasoline, diesel, and even aviation fuel as well as butane and propane gas in the screw-on canisters we’ve all come to know and love, it’s capable of generating heat in any environment and under any conditions. An awful lot of heat too, because it can pump out up to 8,900 BTU/h, which means the OmniLite is easily capable of melting large quantities of snow to produce drinking water, as well as boiling water and heating food. Keeping your inner Ranulph Fiennes hydrated has never been easier. 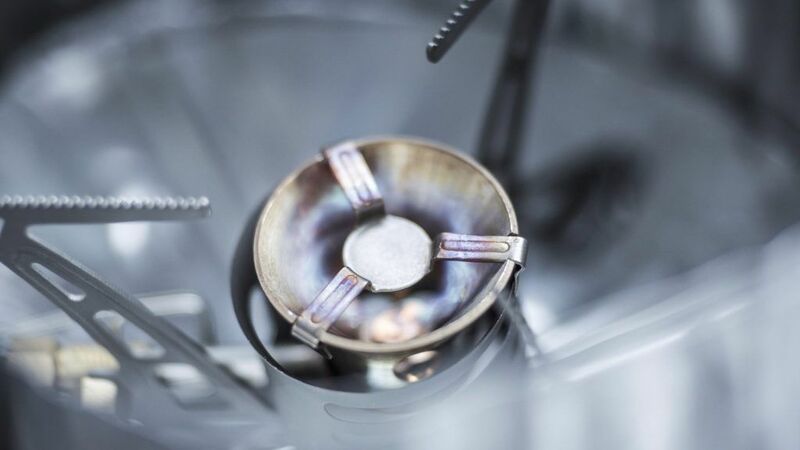 The Ti in its name hints at the use of titanium, an extraordinarily light and strong metal that makes any piece of equipment at least 25% cooler than it would otherwise be. And yet, despite the use of titanium for the fold-out pot stands and windshield, the OmniLite Ti is still packed full of full of gravity, weighing a relatively hefty 239g, or 341g with its storage bag and spare jets. This compares with the featherlight 25g of my titanium summer gas stove. But such comparisons are hardly fair; my little backpacking stove might weigh only a tenth of an OmniLite Ti but it’s nowhere near as versatile, and nowhere near as beautifully built. Few pieces of camping equipment are as well engineered as the OmniLite Ti, a cooker that isn’t only a joy to use but is also designed to be field-stripped, cleaned and repaired using only the one tool. There’s a definite knack to using it with liquid fuels; you need to pump the bottle to build up pressure and then pre-heat the burner before it will vaporise the petrol, diesel, paraffin etc., but doing so soon becomes second nature. The pump handle is made of metal, and operates with a silky precision that isn’t always the case with stoves in this category. The pump can also be stripped down and lubricated if it becomes stiff and hard to pump. Adjusting the stove to a gentle simmer is less easy when using liquid fuels too, but I think that’s a small price to pay to be able to use it at -40C and colder, temperatures in which a gas canister simply wouldn’t work. The adjustment handle is a simple folded wire to save weight, but it gets the job done and is big enough to be operated with gloved hands. Using it with gas at higher ambient temperatures is simplicity itself: you simply screw the canister on, open the valves and light it. 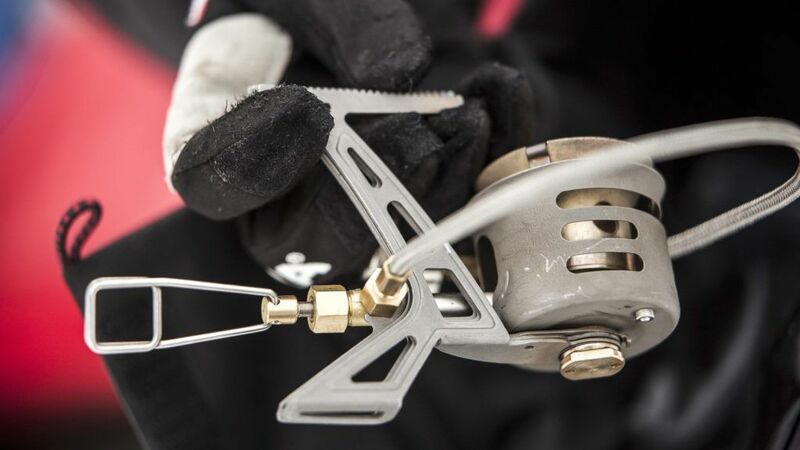 Butane works fine in summer temperatures, but a mix of butane and propane works better in moderately cold conditions. You can even use the gas canister upside-down if it’s cold but you’re better off using a liquid fuel at sub-zero temperatures. There’s a knack to turning it off, too. The pickup tube is cranked over at an angle, and you need to lay the bottle on its side with the word ‘on’ visible. When you’ve finished cooking or melting snow, you turn the whole bottle over so you can read ‘off’ written on the bottle cap. The cooker will draw the remaining fuel through the tube and the flame will go out after half-a-minute or so after which you can turn the valves off, safe in the knowledge that nothing is going to leak in your rucksack. The storage bag is as robust as the stove. It appears to be waterproof and has a roll-over top to seal the contents securely and to provide some means of volumetric control, allowing you to vary the size of the bag depending on how much you’re carrying in it. The front of the bag also has a small zipped pocket in which you keep the spare jets (you need to change the jets depending on what fuel you are burning: 0.45mm for gas; 0.37mm for petrol/gasoline; and 0.28mm for paraffin/kerosene and diesel) and the clip to seal it is made of metal rather than plastic, so isn’t going to snap when it gets cold and brittle. The stove comes with a small multi-tool for changing the jets and stripping it down for cleaning and repair and, interestingly, the cap and pump fit Sigg bottles as well as Primus ones, further proof of the OmniLite Ti’s versatility and class-leading engineering.